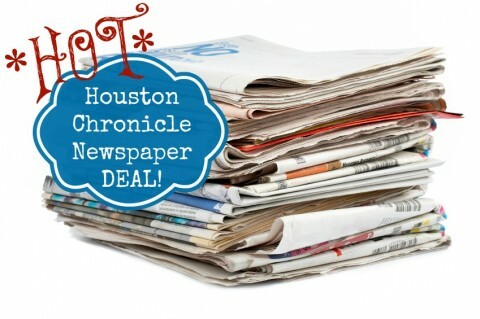 Houston Chronicle Newspaper Deal for $1 per paper DELIVERED TO YOUR HOME!! PLUS Get a $30 Gift Card + $10 Bonus for Referrals! This is the Best Deal on the Houston Chronicle I have ever offered! Our sites or Coupon Classes are the only place you can score this deal, that means that you cannot call the Chronicle and get this offer!!!! You can get up to 5 papers delivered to your home for only $1 each! If you already get one paper you can get 4 more. When you max out at 5 papers total delivered you qualify for a $30 gift card that gets emailed to you about 4 weeks after your papers start. That is essentially getting two months for free! I am doing a second turn in this week for anyone that wants to take advantage of an awesome deal! Loading… You can text 832-510-4270 between the hours of 9:00 AM – 8:00 PM and we can take your order over the phone. You can only pay by credit or debit card over the phone. If you want to pay by cash or check you will have to attend one of our classes. This is the only way to get a multiple subscription offer at a really good price.Click Here to See some of the deals you can score this week from the inserts!Not in Houston? I am working on getting deals in other cities, I have a few but not in a blog friendly format yet. Leave a comment with your city and I will see what I can find of you!